Despite being most well-known for his paintings, as time passes, his true legacy has become his journals (aka notebooks) – so much so that Bill Gates bought a collection of them for $30 million dollars. 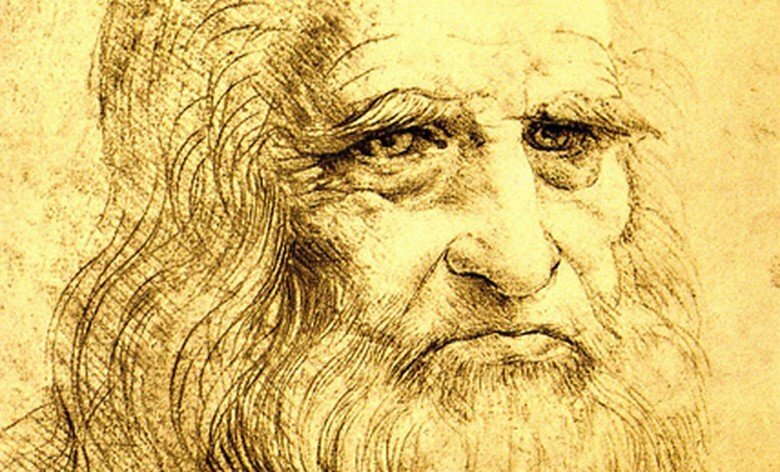 Unlike Bill Gates, I don’t have millions of dollars to buy da Vinci’s original journals but I did still spend the currency of my time reading his biography and observing his journals so I can improve my habit of keeping journals. Now, wanting to understand how da Vinci kept his journal may, at first, seem as pointless as trying to clap with one hand. I mean, how do you try to emulate the journals of someone who is synonymous with genius? However, I do think the observation can still bear fruits, even if you and I don’t have the intellectual gifts (or interest) to paint like him. The way he used and kept his journals, he certainly did something right, so there’s merit in trying to figure out what that was. Sketch of Leonardo da Vinci of himself in his journal. 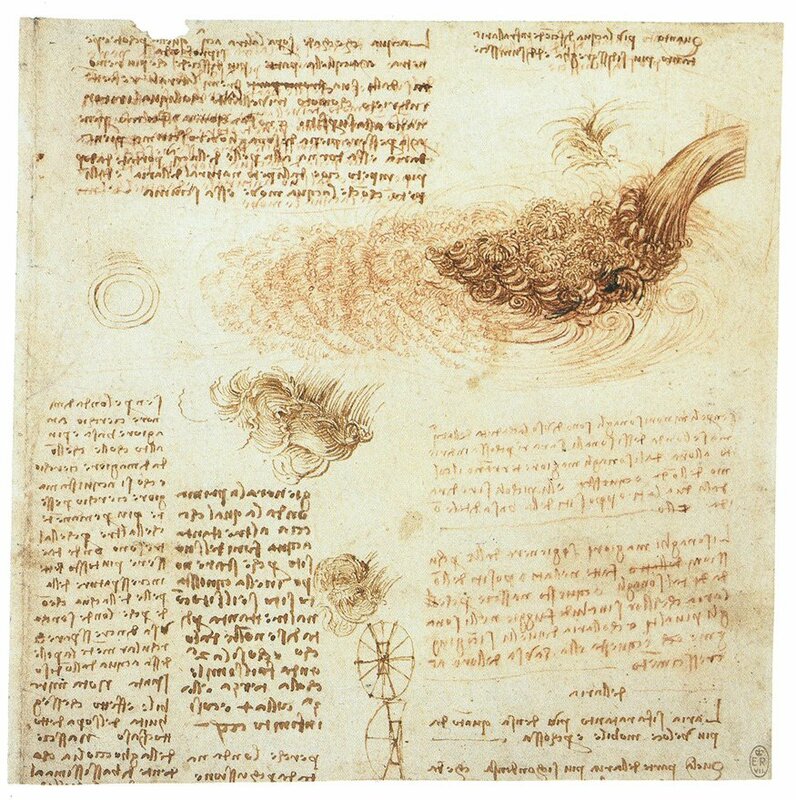 It is estimated that da Vinci produced between 20,000 to 28,000 pages of notes and sketches spanning across 50 different notebooks about work related to whatever topics that interested him – painting, engineering, philosophy, warfare, engineering, physiology, landscape, proportion, perspective, geography, geology, light and shade, inventions and various other topics. From records, available to us, it is known that he started with journals when he was 26 years old and continued to write an average of 3 pages a day until the age of 67 in 1519. Having had a glimpse of his intrinsic desire to be remembered, I think it is now worthwhile to extract learnings from the creation of his desire – the journals. Leonardo spent most of his life as an engineer and architect – but what can be observed from his journals is that he used his them as tool – a means to the end for mastery of the problem at hand. So regardless of which stage of life you are in – parent, student, intellectual, or soul-searching – you can and should use the journal similarly and, like da Vinci, adjust the journals with your changing interests. As I studied his large collection of journals, I took notes whenever I came across factors that I thought were fundamental for his habit of keeping journals. Then, I tried to synthesize these observations and notes into several methods or behaviors that appear to have enabled both da Vinci’s discoveries and deep understanding of his topics of interest – all with the help of keeping such fascinating journals. Above all other observations, it is important to note that it was not an explicit goal of Leonardo da Vinci to have such detailed journals but it was rather his obsession to solve the problem and figure things out which implicitly resulted in such in-depth journals. For anyone who keeps or wants to start a journal, it is extremely important to know their “why” because without it the habit of keeping one will not last very long. For Leonardo, it was his intention to “leave a memory of [himself] in the minds of others” in search for a deeper more lasting meaning to his life. 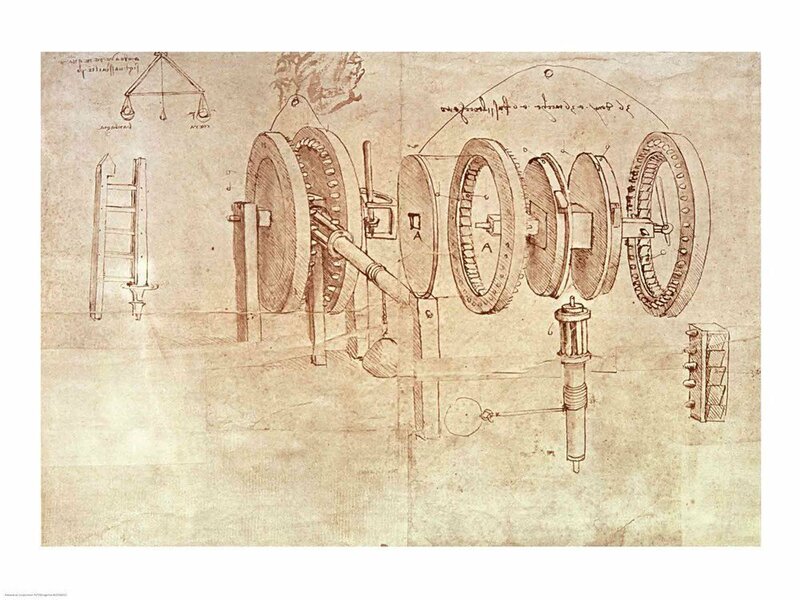 A visual combining Leonardo’s lifetime of inventions and drawings. As I kept progressing through his journals, it was fascinating to observe how he was bringing together various interests and subjects in his work. For example, in his entry on Vitruvian man, he used mathematics, proportions, and anatomy to reach the epiphany – subjects which he had explored before in separate journals. 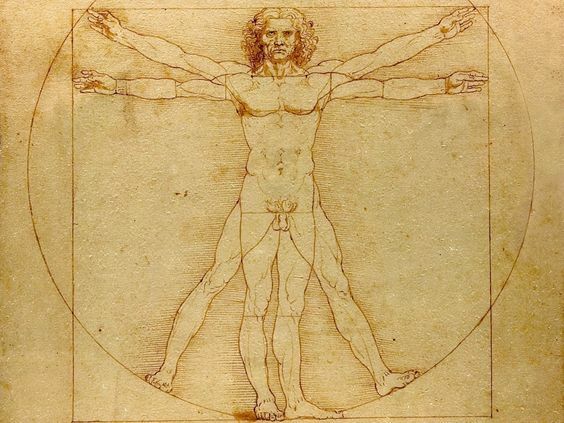 Vitruvian man – sketch in which multiple expertise of da Vinci came together. Likewise, he used paintings to understand nature – asking questions like; why is the sky blue? What effect does light have on the sky? how do the muscles and blood circulation expand or contract the human body? and even questioning religion (I don’t imply anything religious here other than the fact that he was curious about it). This has encouraged me to more deeply explore topics that I write about here on the forever learning journey. I hope to improve my sketching skills (currently I can only doodle), acquire more technical skills to build products, and try my best to bring various subjects and interest together to create unique works. Leonardo has explicitly said that drawing or painting was a tool that he used to better understand the big picture – a means to an end. As a matter of fact, he only produced 20 paintings (or works of arts) before his death but had produced hundreds of sophisticated sketches in his private journal in his attempts to visualize them. It was his drawings and sketches that after his death served as an inspiration for others to understand and benefit from his inventions. I often find myself constrained by only using words to write in my journal or on this blog – at most I have tried some simple doodles. I have made it a future goal to improve my sketching skills and use that to better translate my ideas onto a paper. I am hoping sketching can help me visualize the result – room design, software product design, drawing for relaxation, and much more. It has always remained a mystery as to why Leonardo made little effort to publish his work. Was he being secretive or waiting for the right moment? “I have offended God and mankind because my work didn’t reach the quality it should have.” – Leonardo Da Vinci, on his death bed. Furthermore, his biography includes multiple occasions where he had accepted commissions without finishing them – never producing the work or even moving to another city in midst of the project. Thus, for much of his carrier, he depended on the kindness of patrons – the ruler of Milan, Ludovico Sforza, and then the French king, Francis I. Both these factors are not of a man who was externally or career driven but rather intrinsically driven to produce work. Leonardo da Vinci – Breaking down complex ideas (hygrometer) until they are simple. It is a bit promising to know that even though his inventions were complicated, the process used was simple and can be replicated by others who are trying to work on something complicated – an invention or a personal roadblock that needs to be written out. I have found this technique very helpful as the mind has the tendency to fear the unknown. By putting the whole idea on paper, you can force your mind to work on it step-by-step. Regardless of how many years pass by, this practice of breaking things down is central to how I work and is how I broke down the work required behind studying his journals and writing this article. Leonardo da Vinci – comparing hair and water in his attempt to understand flow of water. Why does it look like that? How does it work? Why does a dog sniff another dog’s behind? Being on a “forever learning journey” of self-education, his way of thinking inspired and reminded me to focus more on the fundamentals and ask questions like a child. However, while taking notes, I also observed somethings that Da Vinci did not do well – which tends to be ignored by the public because of the outcome bias where people don’t criticize bad habits of successful people as “the ends justify the means“). As simple as they sound, they are a lot harder to follow in-practice and I do give him credit for projects he did put his best foot forward because maybe the other projects would not have been successfully if he didn’t move-on from previous projects. The work produced in his journals cannot be entirely separated from who he was. Was his meticulous and detailed journal a result of his intrinsic motivation or intelligence or both? Did his ability to think by asking fundamental questions come from his self-education? Could he have accomplished more “fame” from the works of his journal? I’m not sure there are any clean answers to any of those questions. What is clear, however, was Leonardo da Vinci’s intrinsic desire to produce quality work and search for a deep and fulfilling meaning of his finite life. Thus, even if Leonardo da Vinci genius and works may lay outside the reach of most of us, his curiosity, focus, and journaling habit is still worth emulating. Superb! As for visualizing with pen & paper – this really short 30 min course has progressed my note-taking by leaps and bounds (http://www.thnkclrly.com/class/). Wow, this is amazing. Never had the chance to look into his diary. Thank you for your observation. he must be inspired by ‘ Nataraj ‘ . This article has been very thought provoking and inspiring.. Thanks for sharing. I’m thinking maybe I should start capturing more of my brilliant insights in my journal more often! There’s certainly a genius that’s unleashed and flows with the magic of putting pen to paper. I’m often incredulous at the deep insights and wisdom revealed from… I know not where, once I start writing…. Thanks for the inspiration Jawad ?